In my previous column, I outlined the basic elements of RuleSpeak® from a formal point of view, as part of the Journal's coordinated coverage of Semantics of Business Vocabulary and Business Rules (SBVR). In December 2007, the Object Management Group (OMG) approved the "Semantics of Business Vocabulary and Business Rules" (SBVR) to become an official specification of the OMG. Version 1 (SBVR 1.0) was published January 2008; Versions 2 (SBVR 1.1) & 3 (SBVR 1.2) were published in 2013). SBVR is the first OMG standard for concept models and business rules. SBVR is a highly structured set of fundamental concepts, not a syntax for rule representation — it can support a variety of representational schemes and best practices. In this month's column, extracted from the RuleSpeak Annex for SBVR, I examine RuleSpeak's support for definitions under SBVR, and how it relates to rules. The companion SBVR Speaks column introduces SBVR's treatment of 'definitions' in general and, specifically, covers their representation in the language of SBVR Structured English. 'Essence' by Definitions. A definition should always focus on the core essence of a concept — that is, on fundamental meaning that is unlikely to change. Such meaning is expressed as naturally as possible. The form of language used in common dictionaries is strongly preferred. 'Boundaries' by Rules. All constraints should be expressed as rules separate from definitions. Such rules generally define the 'boundary conditions' of a concept; that is, when something is or is not an instance of the concept. Since specific boundaries for a concept (e.g., 'gold customer') can change over time, they should not be embedded in definitions. An additional advantage — crucial for communication with and among business people — is that the underlying vocabulary can be kept as compact and as focused as possible. Consider what 'agency' means to EU-Rent: these are service desks in hotels, travel agents, etc. They have storage space for few cars, and are operated on demand by part-time staff who will typically do the entire workflows for rental and return. Here is EU-Rent's formal definition. Note: Some things are based at EU-Rent sites	that are owned by third parties such as hotels and travel agents. 1. Find a suitable definition from a standard dictionary (or, if available, an industry glossary) to serve as the basis for the definition. The Merriam-Webster Unabridged Dictionary offers the following for 'agency', which is an appropriate basis for an essence definition. Aside: Recall that 'agency' is a category of 'branch', its general concept (as noted in the entry above by the General Concept caption). An alternative wording for the definition, incorporating the general concept instead of listing it separately, is: "a branch that is a company engaged in conducting EU-Rent business operations". Either approach is acceptable. 2. Define verb concepts for 'agency'. For this example, assume an agency has the following (binary) verb concepts by virtue of being a branch. These verb concepts would probably be indicated as properties. RuleSpeak does not emphasize using characteristics (unary verb concepts) for building definitions. 3. Define the appropriate definitional rule(s) to establish (current) boundaries for the concept 'agency'. Note that these boundaries might be modified, expanded, or contracted over time. It has	a third-party location. It has	a minimal car storage capacity. 4. Specify definitional rules for derived terms (e.g., 'third-party location', 'minimal', etc.). Comment: Derived concepts are generally not given definitions in RuleSpeak since the definitional rule(s) for them are, literally, definitive. In RuleSpeak, the distinction between definitional rules and behavioral rules is viewed as follows. Definitional rules prescribe criteria for how the business chooses to organize ('define') its business semantics. Such rules express criteria for correct decisions, derivations, or business computations. Definitional rules supplement definitions. Behavioral business rules focus directly on the propriety of conduct in circumstances (business activity) where willful or uninformed actions can fall outside the boundaries of behavior deemed acceptable. Unlike definitional rules, behavioral rules can be violated directly. Therefore, rules about creating bookings (e.g., that the requested pick-up date-time is to be after the booking date-time) are to be viewed as definitional. If not followed (applied) in creating a booking, the booking is simply invalid. In other words, since bookings are a knowledge 'thing', the business can establish definitive rules for them. These are the boundary rules discussed earlier. Now consider 'actual pick-up date-time', the date-time when possession of a rental car is actually handed over to a rental customer (or is said to have been, anyway). EU-Rent might want to avoid post-dating handovers — i.e., have a rule that the actual pick-up date-time is to be after the booking date-time. This case is quite different. 'Actual pick-up date-time' reflects activity (or the communication thereof) outside the realm of knowledge artifacts — i.e., conduct that takes place in the 'real world'. Because such rules can be broken (by people), they are behavioral. RuleSpeak Best Practice: Carefully distinguish what should be (according to the definitional rules) vs. what really is, based on actual business decisions / actions. One or more behavioral rules are then specified to constrain 'what really is' against 'what should be'. These latter rules, being behavioral, are the ones that can be violated. Ronald G. Ross, Principles of the Business Rule Approach, Boston, MA: Addison-Wesley, 2003, Chapters 8-12. Versions of RuleSpeak have been available from Business Rule Solutions, LLC since the late 1990s, available for download at RuleSpeak.com. Public seminars have taught the syntax to thousands of professionals starting in 1996 (www.AttainingEdge.com). The original research commenced in 1985, and was published in The Business Rule Book, 1994 (www.BRSolutions.com). Ronald G. Ross. Business Rule Concepts: Getting to the Point of Knowledge. 4th ed. 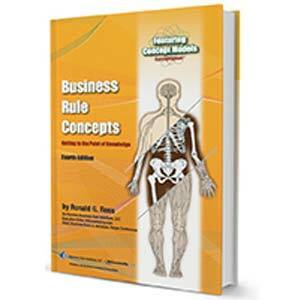 : Business Rule Solutions, LLC, 2013, Chapter 5, pp. 61-62. (www.BRSolutions.com/b_concepts.php). The car rental examples come from EU-Rent, a (fictitious) car rental company. This popular case study was contributed to the SBVR effort by Model Systems and appears in detail as Annex G of the SBVR document. Ronald G. Ross. Business Rule Concepts: Getting to the Point of Knowledge. 4th ed. : Business Rule Solutions, LLC, 2013, Chapter 7. (www.BRSolutions.com/b_concepts.php).